Most people know the names of most dental prosthetics such as implants, crowns, or veneers. Ask them what is an inlay or an onlay, however, and you’re apt to get a blank look. 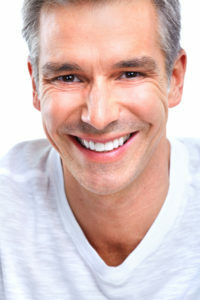 At Prosthodontics of New York, we use these two dental restorations for returning normal tooth structure and function, and as an alternative to the more aggressive option of a full dental crown. Their names derive from their location: inlays are placed within the cusp tips of the tooth; onlays usually cover the entire chewing surface including one or more tooth cusps. What is a dental inlay? We usually opt for an inlay when a tooth has too much damage to support a normal filling, yet still has enough strength to not require a crown. An inlay by definition has to be placed on the tooth’s chewing surface between the cusps. Sometimes inlays are called “indirect fillings.” This is because the inlay is created at a dental lab and then it is placed in the dental office. We usually opt for porcelain for our inlays because it is invisible on the tooth and is more durable than composite resin. What is a dental onlay? When the damage is more extensive, Dr. Roberts or Dr. Sirota may opt for a dental onlay. An onlay falls in between a large filling and a crown. Onlays are used when the damage involves not only the chewing surface but one or more of the cusps of the tooth as well. We like onlays because they can enable us to save the tooth, actually strengthening it, without having to resort to a crown. Like inlays, onlays are usually made of porcelain and can last up to 30 years. They are less expensive than a crown. These restorations require two appointments. The first appointment is used to prepare the tooth. We first remove all of the decay, and then we take impressions and photos to send to the dental lab for the fabrication of your custom inlay/onlay. This usually takes around two weeks, so we’ll place a temporary restoration onto the tooth for the waiting period. When your inlay/onlay arrives in our offices, you return for your second appointment. We first remove the temporary filling and thoroughly clean the tooth. We then check the fit and color match of the inlay/onlay. If satisfied, we permanently cement it into place, and you’re good to go. Is it time for your regular cleaning and exam with the team at Prosthodontics of New York? Or do you have some tooth pain? Call us at (212) 758-9690 to make an appointment.